A rare combination of feelings of deep grief and utter pride was in the air over the Yerablur Military Cemetery in Yerevan Tuesday afternoon as three Armenian pilots killed on board a military helicopter shot down by Azerbaijani forces near Nagorno-Karabakh’s Line of Contact on November 12 were laid to rest with full military honors. The 10-day saga with the recovery of the bodies of 38-year-old Major Sergey Sahakyan, the commander of the ill-starred Mi-24 helicopter, and his two subordinates, 25-year-old Senior Lieutenant Sargis Nazaryan and 22-year-old Lieutenant Azat Sahakyan, ended early on Saturday as a small group of Armenian commandoes managed to make their way to the wreckage site in no man’s land under the enemy’s very nose. Azerbaijan had kept the area under heavy fire even after calls of international mediators to provide Armenians with a humanitarian corridor to evacuate the bodies. 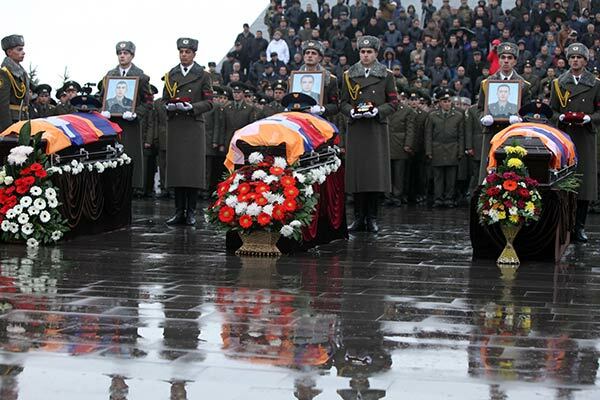 The names of the four brave men who risked their lives in the recovery operation that has already been described by military experts as unprecedented by its efficiency and is likely to go down in the history books perhaps will not be revealed to the public for quite a long time, but the spirit of their heroism was inevitably present at the solemn ceremony at the Yerevan pantheon. The salvoes fired into the cloudy skies in honor of the three young men cut off in their prime also sounded like a message to the enemy across the eastern boundary that “Armenians never leave their dead in the battlefield” and a pledge of the nation to continue to stand firm and united despite the trying ordeal. All of the three killed pilots graduated from the Aviation Institute of the Armenian Defense Ministry and served in the Air Force of the Armenian Army. Major Sergey Sahakyan was born in Yerevan, he was married and had three children. He served at the military unit of helicopter base N15 located at the Erebuni military airport. He was an officer of Armenia’s Air Force. The other two pilots were unmarried. Senior Lieutenant Sargis Nazaryan was 25 years old, he was born in Yerevan. Lieutenant Azat Sahakyan, who was 22 years old and was also born in Yerevan, lived in Charentsavan. On Monday evening a service was performed for the three dead pilots at the church in Yerevan’s Nor Nork district. Despite the sleet the flow of people wishing to attend the service and pay their homage to the memory of the pilots seemed unceasing. The service was performed by Catholicos of All Armenians Karekin II, attending the ceremony were President of Armenia Serzh Sargsyan, Prime Minister Hovik Abrahamyan, the Defense Ministers of Armenia and Nagorno-Karabakh, Seyran Ohanyan and Movses Hakobyan, other government and military officials. Deputy chief of staff at the aviation unit, Major Vachagan Stepanyan described all the three killed pilots as wonderful personalities as he talked to reporters late on Monday. “Sergey was a great personality endowed with high intellect. Lieutenant Sargis Nazarian was also very clever and smart, a person dedicated to his service, he graduated from the Aviation Institute with honors, was a man of vast knowledge. Being a pilot was his passion, and one of Azat’s dreams was to participate in military exercises, especially in Artsakh,” Stepanyan said. Aviation Unit Major Gor Ghazaryan said he had served with Sergey Sahakyan for 19 years, sharing all the difficulties and joys of service. “It’s hard to speak about Azat and Sargis, both were young, disciplined, trained officers. One could not expect something else from a state that glorifies villains like [Ramil] Safarov [editor: an Azerbaijani officer who axe-murdered an Armenian officer during a NATO training course in Hungary in 2004 and was pardoned and glorified at home immediate after being controversially extradited in 2012]. It is not the first time that they have revealed their true face, but I, personally, and on behalf of our unit promise to the guys that we will remain committed to the cause, and let even the grandchildren of Heydar [Aliyev, the late president of Azerbaijan and father of the current president Ilham Aliyev] know that eagles are born in the mountains. And redemption will come in due time. It is the conflict that will end only and only in our victory,” the Armenian officer concluded.